The Medicine Tree Herbal Pharmacy, Acupuncture & Massage Clinic has proudly served the community from the South Minneapolis Longfellow neighborhood for 10 years, and we hope to continue doing so for many more. Since it's inception, it has grown and taken on two storefronts in the 3700 Commons building of 34th Street. Recently the original owner, Dina Goodwill, moved on to pursue new opportunities and has left the care of The Medicine Tree in new hands. My name is Sara Fetyko; I am a long time resident of Minneapolis, mother of two boys, outdoor enthusiast and a passionate practitioner of Eastern Medicine, focusing on acupuncture. The departure of Dina represented an opportunity for me to achieve a longtime dream: to run an acupuncture clinic that serves the community I live in. Although the clinic services and Herbal Pharmacy are now housed in two spaces and headed by two different faces, The Medicine Tree remains a collaborative community of healers. 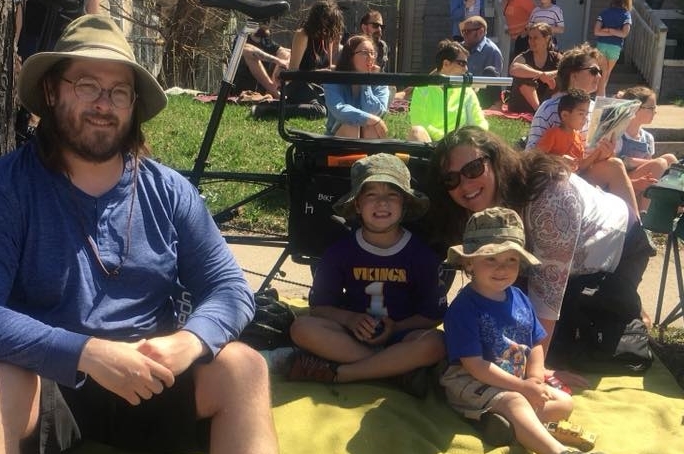 Enjoying the May Day parade with my husband and two boys. Always a family favorite.